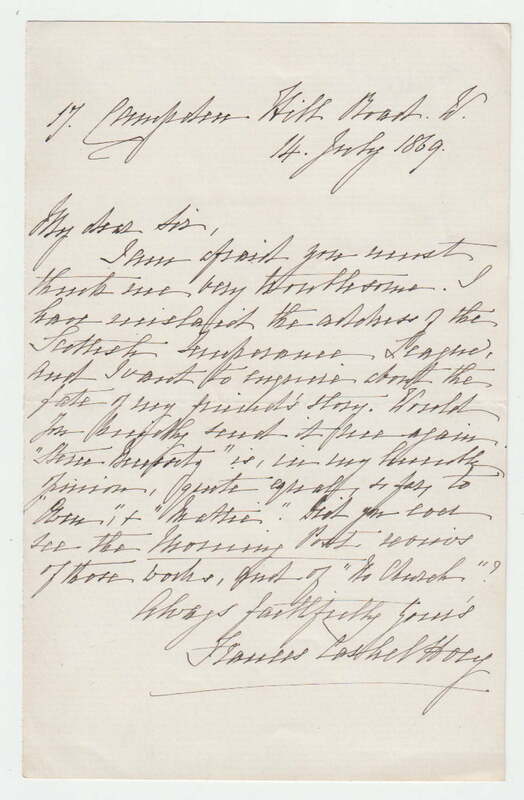 Autograph Letter Signed ‘Frances Cashel Hoey’, asking for the address of the Scottish Temperance League, and discussing book reviews. 1 page 7 x 4½ inches, fine. 17 Campden Hill Road. 14 July 1869. Frances Sarah Cashel Hoey [née Frances Sarah Johnston] (1830–1908), Irish novelist and nationalist. Frances Hoey’s eleven novels, published between 1868 and 1886, abound in sensational crises and exemplary tragedies of misplaced love.